News-jacking is the public relations tactic of getting coverage for your brand, company or product by piggy-backing on a breaking news story, usually by issuing a comment or quote. In most cases, the breaking story will be dominating the news headlines and is of a more serious nature. 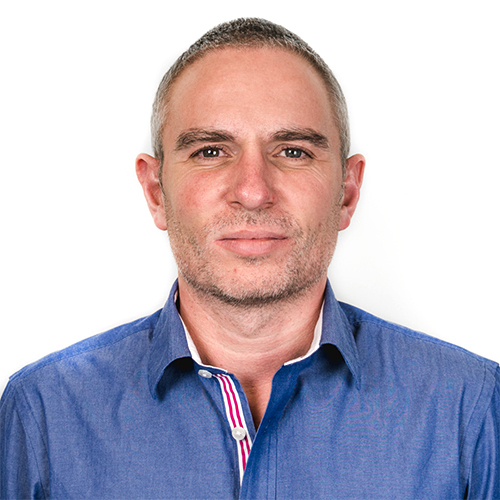 How do you launch a news-jacking story? As soon as you have seen a story that you can react to, you need to get a statement out to the media. There are a few things that you need to remember, the most important being that you need to be fast. The second most important thing is that you need to say something genuinely interesting and relevant. The final thing is that you need to have credibility as an expert in the field that’s being spoken about. 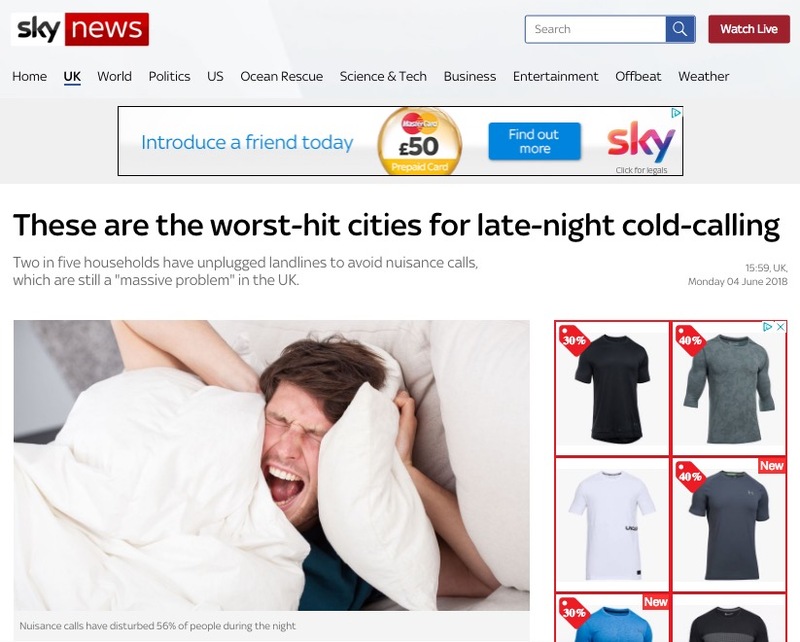 What are the benefits of news-jacking? 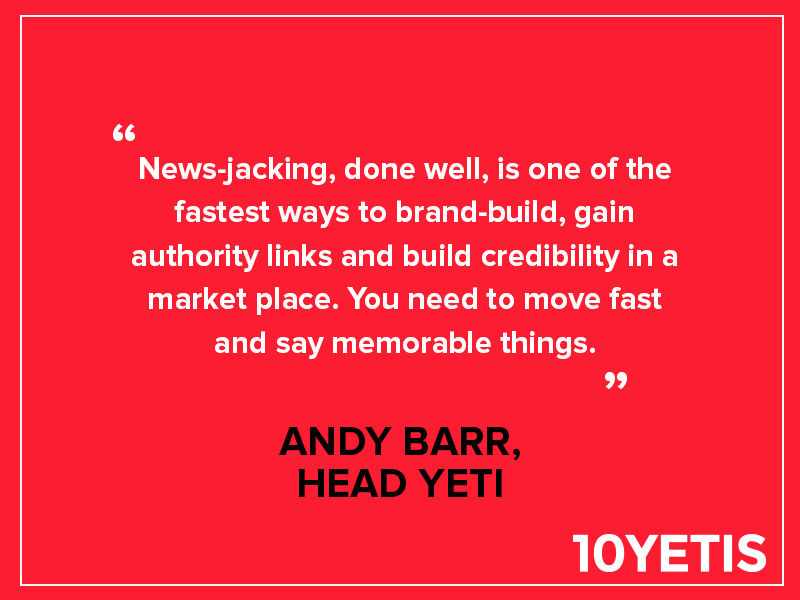 News-jacking is a really fast way to build a brand, get authority links (PR for SEO) and also build credibility for your chosen “expert” in their market place. The added benefit is that, if you get it right, it is a brilliant way to build relationships with journalists and get on their radar for future stories. Are there any secret news-jacking hints and tips? As Tom Cruise said, “I feel the need, the need for speed” and, as we have said, speed is vital for news-jacking but here are three further, secret tips that will help you. Tip One: When you have put together your interesting quote, and done so in record time, go to the non-paid-for Press Association newswire with the quote. The Press Association newswire goes into every major newsroom across the UK and even around the world in some cases. This is not an easy sell, though, so don’t get your hopes up. The PA news desk is a notoriously tough nut to crack and it is guarded by a guy who will tell you, with no dressing up at all, if he thinks the story is worthy of letting you speak to one of his news team or not. Very much like an Indiana Jones film, the risk is worth it! If you can get on the PA wire, your story will go on to do amazingly well and you can pack up for the day and pretend you had to work really hard. Tip Two: Be quirky! This is not to be confused with being creepy or a bit weird. Journalists remember people who say interesting or controversial things. Journalists also receive hundreds of emails in reaction to big news stories breaking and, with this in mind, you need to stand out. An example of this is when I worked in financial services for a building society. I was invited onto the radio to talk about an impending housing market collapse. I said there was “more chance of the Loch Ness Monster swimming up the River Thames than a housing market crash”. Sadly, the next day the housing market crash did actually arrive. It didn’t matter though, my quote had been picked up by a radio newswire the day before and I was then always used for quotes going forward. I had said something really dull, but in an interesting way. Tip three: Have a super “on-it” client or boss. It is important that the people you work with get it, in terms of the need to be flexible and roll with the media agenda. The people who understand that it is not just about ramming a sales message down the throats of journalists are the ones who get the best results. The following case study is a great example of this. 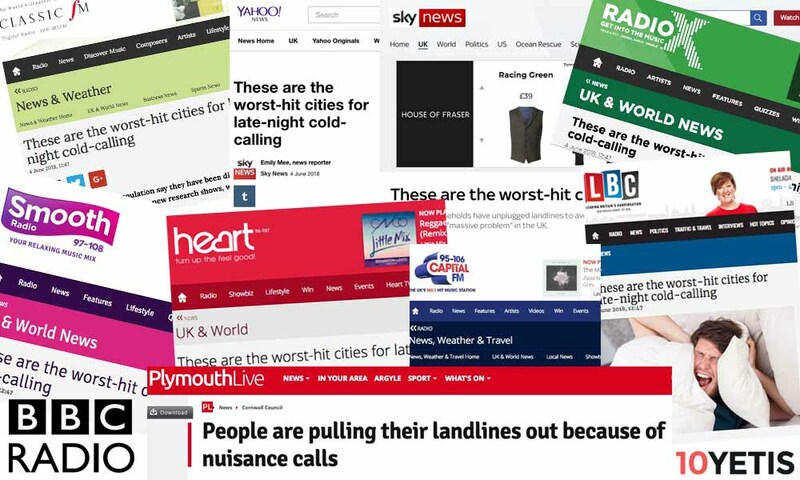 A real life example of a news-jacking story, using our client BroadbandChoices as the case study. The UK Government opened a consultation that proposed to change the laws around nuisance calls so that the directors of companies found guilty of doing this would also be personally fined. This was a big story in the UK media and all the heavyweight press, online and offline, including broadcast, covered it. On the day that this story broke, 10 Yetis (10Y) were meeting with existing client BroadbandChoices.co.uk (BC) for an impromptu coffee (the drink of champions). Given BC’s credibility and brand strength in the phone and broadband industry, they were well positioned to get involved in this story. A coffee-shop plan was drawn up to carry out a snap poll that could run overnight using a third party polling company and would ask questions around landline phone usage and if consumers or their kids had ever been woken by nuisance calls. We both felt this was a natural extension of the story and would give it a “lifestyle” feel. 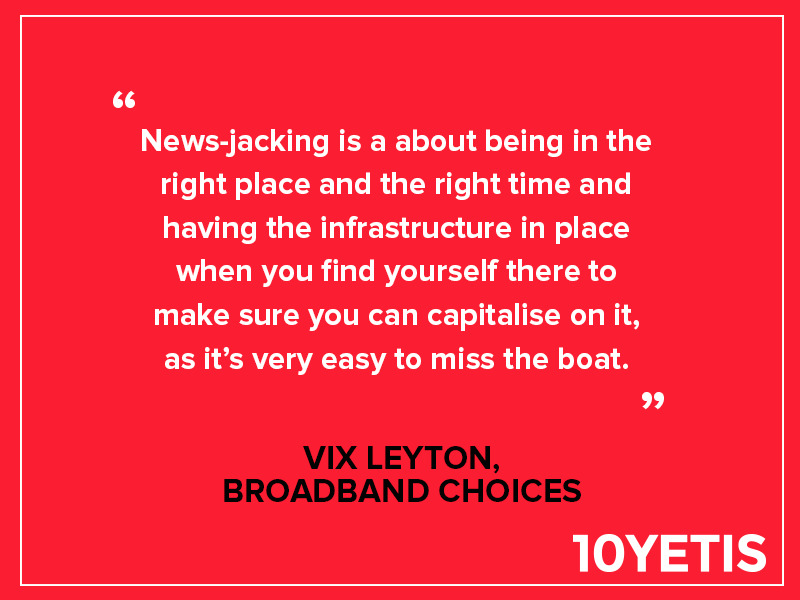 The results came back in the next morning and were quickly turned into a release, complete with an engaging quote from the client Head of Comms PR Manager and home comms spokesperson, Vix Leyton. Vix also signed off the story in record time and it was ready to go out. As per our secret news-jacking tips we went to the Press Association first to try and get them interested in the story. As I also said, this is really hard… and in this case they said no, so we hit the phones and starting selling in to relevant media. As is PR101, you go after the big titles first and also use your skills at realising what outlets trigger follow-up coverage on other media outlets. In this case we secured SkyNews online and this went on to trigger the syndication of the story across all of the media outlets that use SkyNews as a kind of media wire. KABOOM. The story started popping up in a whole host of places. Vix was then in demand for a BBC Radio interview, which she absolutely nailed. The BBC is the Holy Grail when it comes to the places where you want to secure coverage. A secondary piece of work for campaigns like this, especially where it is aimed at securing high domain authority links back to the client site, is to carry out “link reclamation”. This can often take longer than writing and sending the original story. This is where you ring the media outlets where you have secured coverage and ask for a link to the client to be inserted in the story. The tips for this are an entirely new blog post in its own right! All in all, this one reactive alone secured over 60 pieces of credible, high domain authority coverage. This not only helps with BroadbandChoices search engine optimization campaigns but it also furthers their reputation as thought-leaders in their sector and boosts the company credibility that little bit more. Needless to say, all this would not have been possible without Vix moving like lightning to get the questions agreed and out for a survey, along with the fast turnaround time of the press release approval. Another well-deserved congratulations goes to Leanne and Sam in our team who worked on this story.